Just wanted to inform you that we`ve launched a new US-based server. 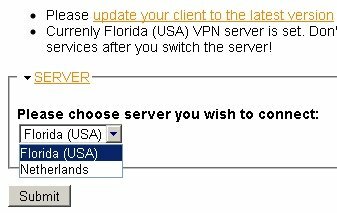 Besides now you can switch servers manually at out website, using the "Connection settings" page. In order to use this feature, you should upgrade your Alonweb OpenVPN client to the latest version, which you can get here: http://static.alonweb.com/downloads/openvpn.exe. Don`t forget to uninstall the existing client before installing a new one. P.S. More servers are to be added soon :).